There is a wide range of dental biomaterials with varied and complex composition. There are too many sensibilizing substances in dental materials and a careful study of their composition is necessary for choose the appropriate contact allergens in cases of suspicion of contact hypersensitivity to dental materials. We attempt to facilitate the diagnostic of contact allergy due to dental biomaterials by classifying the basic sensitizing components in different groups of dental biomaterials. Key words: dental materials, contact hypersensitivity, diagnostic. 1. Ivanova, I. Intraoral contact hypersensitivity to prosthodontic biomaterials. Dissertation 2008. 2. Kisselova, A. Dental allergology and Focal diagnostic. Monograph, publisher ‘’Gutenberg”, Sofia, 2001, p.327. 3. Petrunov, B., V. Dimitrov, A. Kisselova. Clinical immunology, clinical allergology, clinical dental allergology. Book, publisher ‘’Arso”, Sofia, 2009. 4. Stoeva, I., R. Velikova, A. Kisselova. An attempt to improve diagnostics of contact allergy due to dental composite materials. Problems of Dental Medicine 2010; XXXVI (2):80-87. 5. Stoeva, I. Practical guide of clinical dental allergology. 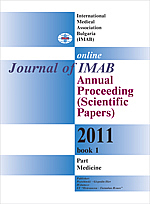 Publisher ‘’Medical University-Plovdiv”, 2011, p.93.